State Street's newest foodie face is Petros Benekos, whose eponymous restaurant opens this month. At Petros Restaurant, Volos olives are plated for diners enjoying one of the most underrated outdoor spaces in Santa Barbara: an open-air patio cornered on State Street and Arlington Avenue, across from the historic theater. The grounds, formerly home to Café Buenos Aires, have hosted a fair share of tango dancers. But Petros has switched gears from Argentinean to modern Mediterranean with an exotic, geometric fountain, two small bars, and a stainless steel rotisserie, as well as a colorful array of citrus trees. While focus is on traditional Hellenic recipes, California wine country’s farm-to-table influence is strong. 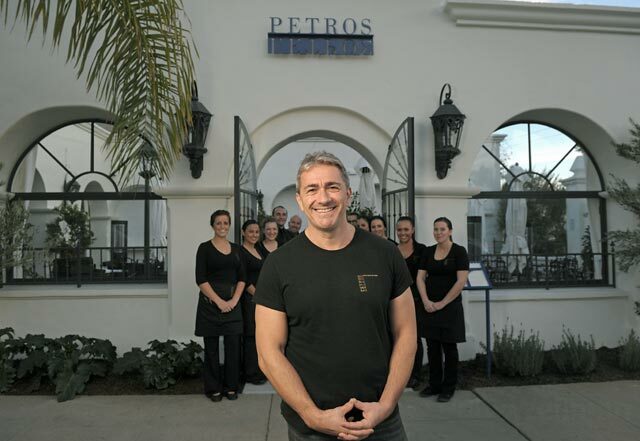 Owner Petros Benekos’s success — he has two other locations, in Manhattan Beach and Los Olivos — is due in large part to the careful attention paid to featuring only ingredients of the highest quality. Cue the voluptuous fruit of olives pressed into oil, honeyed nectar drizzled on Manouri cheese, and slippery pink salmon. The new location, open daily for lunch and dinner, will serve a variation on the other two spots’ menus, highlighting favorites such as the dip combo and a lighter twist on classic ground beef moussaka, while placing an emphasis on rotisserie meats and fish, as well as pizzas. Reach for a piece of warm grilled pita bread on which to slather smoked, caviar-based taramosalata while ruminating over entrée choices, where fish dishes such as branzino or snapper shine through olive oil and citrus. A special treat that downtowners no longer have to drive out to Los Olivos for is bougatsa, the restaurant’s best dessert. Proceed with caution, as you may find yourself lusting after the aromatic vanilla bean and semolina custard wrapped in flaky phyllo crust and cinnamon long after your visit. Petros finely demonstrates how your eyes can sometimes be bigger than your stomach. Get yourself to the Greek at Petros, 1316 State Street, (805) 899-9100.